Short Answer: If you're looking to be organized, whether to simplify your life or to get aboard a boat and cruise away, consider investing some time in Getting Things Done. Long Story: About a year ago, I discovered David Allen and “Getting Things Done.” Basically, he's a productivity-guy, expensive-suit-that-HR-hires, vain-attempt-to-improve-management, guru guy. However, his ideas stand head and shoulders above the rest, and GTD is basically the credo of many in software and hardware development. At some point it seemed like all my friends were doing it, so I had to do it too. Like Facebook except more so. I'm just a follower, what can I say? 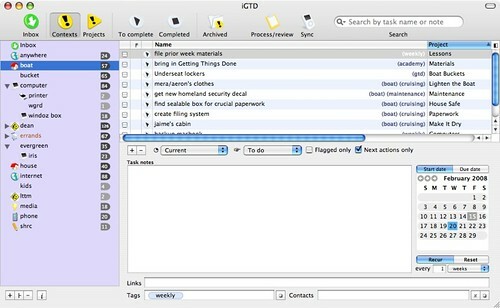 The magic of GTD is largely in the concepts of inbox zero and organizing your work into contexts and projects. Briefly, context is where you get something done. Project is a set of things you need to do with a specific, desired outcome. 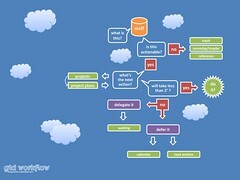 Next actions are tasks that take you incrementally towards completing a project. And inbox zero is the notion that you never have a pile in your life. No junk drawer, no stacked inbox, no long list of email messages. Everything that comes into your life is immediately converted into a project with a list of actions which you will complete in context. Then you stick the entire lot into your trusted system. A trusted system is where you keep track of all your next actions. It's a to do list on steroids. It goes like this... the moment you think of something you need to do, you dump it into your trusted system. Your trusted system can be a notebook, a spreadsheet, Outlook, a wiki, or bunch of index cards stuck together with a clip (a.k.a. the Hipster PDA). The important thing is that you don't let that little bit of “I need to get this done” in your head. You put it down someplace where you know that thought will not get lost. My trusted system which stores every thought and action in my life is an application called iGTD. If you have a Mac you need to get a copy of this. Now. I'll wait. So far, it's quite possible that GTD skates perilously close to meeting Ze Frank's criteria for “a small solvable task not identical but related to the thing that's being put off”. Certainly, to do lists are a creative way to get busy and productive without actually completing anything substantive. However, my favorite addictive method of procrastinating is composing pithy posts for this blog. My to-do list currently includes sixteen contexts, one hundred sixty projects and nearly one thousand actions with many of them due in the next two months. It seems like a lot. In fact, I have this niggly suspicion that had I re-purposed the time I used to type in those thousand tasks to instead actually do one, I might be better off. Yet, breaking the list down it starts to look depressingly comprehensive and completely without stuff I could just throw overboard and ignore. The antidepressants are helping, thank you very much, but the occasional panic attack is surely justified. Roughly 20% of my tasks have to do with closing down my husband's business and making it go away forever. Another sizable proportion relates to renting the house. Many tasks are bucketed as Academy and constitute the ongoing grind which is keeping the girls busy and steadily progressing forward in their ability to read, write, and speak in soft, reasonable tones to people either older or bigger than themselves. Then to make matters more interesting, my clients all decided this month that they need work done. Go figure. They couldn't wait until March or April. No, it all has to be done now. So tack on about thirty or forty tasks just get all that crap done. Granted, it builds the cruising kitty, but I'm beginning to really resent working for a living. “But what about the boat?” you say. Well, I'm glad you asked. 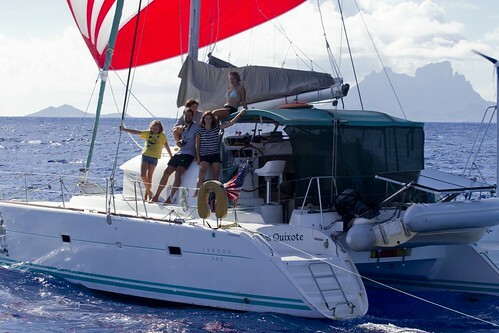 Of the total, only 20% get slotted as Boat Projects. Fortunately, I get to ignore most of those until spring. Other than the heater, there is no earthly reason I should care about whether or not the bimini is growing mold or the deck looks like two seagulls fought it out and then vomited crab guts and blackberry juice. And the rest? Well, those really aren't mine. They belong to Dr C. Turns out that I am HIS trusted system. Hee-hee. Ronnie just posted a sidebar link on her blog to his GTD in Outlook whitepaper. Happy to hear the news about the letter of intent. Keep on keepin' on!